The invention discloses a search method comprising the following steps of: searching contents of interest submitted by a user in a client and based on the contents, generating a mark label corresponding to the contents; uploading an ID of the search user, the contents submitted in step A1 and the mark label to a server to be stored in the historical search database; obtaining a historical label and the corresponding user ID, computing matching degrees of the contents submitted in step A1 with contents under the historical label, sorting the contents based on the matching degrees and preferentially recommending other contents which have relatively high matching degrees under the historical label to the search user; and preferentially recommending other contents the total amount of which is small under the historical label if the matching degrees are the same. 本发明涉及计算机技术领域，尤其涉及ー种高命中率的信息捜索方法。  The present invention relates to computer technology, and in particular relates to a high hit ratio ー species information Dissatisfied cable method. 1，根据所有用户针对某个选择的比例来进行推荐，当出现搜索结果时，选择多的结果优先推荐。  1, according to all the users to make recommendations for the selection of a certain proportion, when the search results appear, choose more results first priority. 当然其中还有其他參考的算法，比如结果的可信度，用户选择后的行为判断等。 Of course, there are other references which algorithms, such as reliability, behavior after the user selects the result of judgment. 由于这种搜索基于大多数人的选择，所以命中率不高。 Because of this search is based on choice of most people, so the hit rate is not high. 2，情境搜索是综合考虑用户背景、兴趣爱好以及环境的智能化捜索，通过对用户意图的深入理解，在用户使用互联网服务的各种场景下提供给用户的最贴切的捜索服务。  2, context search is considering user background, interests and intelligent environment Dissatisfied with cable, in-depth understanding of user intent to provide to the user the most appropriate Dissatisfied with cable service in a variety of scenarios use the Internet services. 情境捜索包含7个要素（6W&1H)，它强调“以人（Who)为本”，也就是以用户为中心，根据其搜索行为的时间（When)、地点（Where)、输入（What)、需求（Want)、习惯（How)、背景（Why)等因素，由情境计算得到最适合的捜索結果，再将这ー结果通过用户的捜索情境直接呈现。 Situation Dissatisfied with cable contains seven elements (6W & 1H), it stressed that "people (Who) oriented", it is user-centric, depending on the time (When) their search behavior, location (Where), input (What), demand (Want), habits (How), background (Why) and other factors, calculated by the situation Dissatisfied with the most suitable search result, then this ー results presented directly by users Dissatisfied with cable situations. 但是这种搜索一定基于预先设计好的分类标准才能生效，比如用户关注阿凡达，搜索引擎必须知道阿凡达是部电影，而且是部科幻片，3D大作，才有可能推荐同类的因素。 But this search for a certain classification criteria based on pre-designed to take effect, such as the user concerned Avatar, the search engines must know that Avatar is a movie, but also a science fiction film, 3D masterpiece, will it be possible recommended similar factors. 本发明所要解决的技术问题是针对现有技术的不足提供一种搜索方法——即同好捜索，所谓同好捜索，本质就是找到和捜索用户爱好相同或者相近的人，将他们喜欢的东西优先推荐给搜索用户，而不是传统上的分类推荐。  The present invention solves the technical problem of providing for the deficiencies in the prior art method of searching - that enthusiasts Dissatisfied cord, the so-called enthusiasts Dissatisfied with cable essence is to find and Dissatisfied with cable users interested in the same or similar people, their favorite things first priority to the search user, rather than the traditional classification recommended. A5，获取步骤A3所述的历史标签，及其对应的用户ID，计算步骤Al所提交的内容与所述的历史标签下的内容的匹配度，按照匹配度进行排序，优先向所述搜索用户推荐匹配度较高的历史标签下的其他内容；相同匹配度下，优先推荐内容总量少的历史标签下的其他内容。 The matching of the content of the history and content of the label  A5, the step of obtaining the history tab A3, and the corresponding user ID, the calculation step Al submitted, sorted by degree of match, the priority of the other content under high historical label referred to recommend matching the search user; matching the same degree, priority would be little else in the history of the total content label. A22，询问搜索用户是否注册ID，若为是，则进行ID注册为搜索用户建立ID后，则将步骤Al所提交的内容连同所述建立的ID及其标记标签存储至历史搜索数据库中；若为否，系统为搜索用户提供计算ID，将步骤Al所提交的内容、所述计算ID及其标记标签存储至历史搜索数据库中。  A22, asking the user whether search registration ID, if yes, then perform the search user ID is registered as the establishment of ID, content will be submitted along with Al steps of the established ID tag and label stored in a database search history ; if NO, the system provides a user ID is calculated for the search, step Al content submitted, and the calculated tag label ID stored in the historical search database. 所述搜索方法，所述客户端为计算机或智能手机終端或掌上电脑。  The search method, the client is a computer terminal or a smart phone or PDA. 这样利用“内容”、“标签”、“用户ID”，捜索用户轻而易举就找到了与其具有相同或相近似的追求的用户，命中率高，可以应用于所有领域，而不必有事先的分类标准。  Such use of "content," "label", "User ID" user Dissatisfied cable easy to find a user having substantially identical or similar thereto pursued, hit rate, it can be applied to all fields, without having to have prior classification criteria. 它是ー种先按照用户喜好去匹配拥有同样喜好的人，然后将拥有同样喜好的人的选择共享给拥有同样喜好的用户。 It is the first kind ー in accordance with user preferences to match people with the same preferences, and then will have the same preferences of people choose to share to the user with the same preferences. 而不必担心这种喜好是否是系统已知的分类。 Without having to worry about whether this preference is known to the system classification. 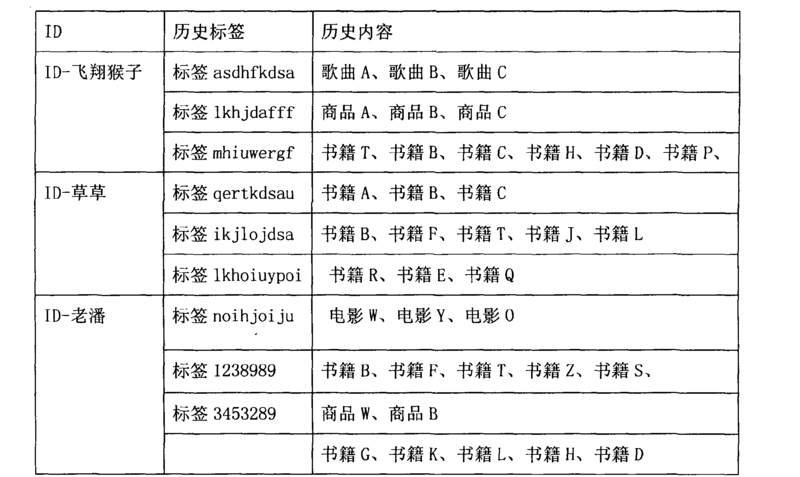 图2为本发明在服务器端建立历史搜索数据库的流程图。  FIG 2 is a flowchart of the establishment of the historical search database on the server side to the invention. 以下结合具体实施例，对本发明进行详细说明。  The following embodiments with reference to specific embodiments, the present invention will be described in detail. A5，获取步骤A3所述的历史标签，及其对应的用户ID，计算步骤Al所提交的内容与所述的历史标签下的内容的匹配度，按照匹配度进行排序，优先向所述搜索用户推荐匹配度较高的历史标签下的其他内容；相同匹配度下，优先推荐内容总量少的历史标签下的其他内容，比如捜索用户提交了书籍B、书籍F、书籍T，在表I中有两个标签——标签ikjlojdsa和标签1238989分别完全包含了书籍B、书籍F、书籍T，则优先推荐这两个标签下的其他内容，例如书籍J、书籍L、书籍Z，但是由于标签1238989下内容较少，所以优先推荐书籍z，其次推荐书籍J和书籍し而有ー个标签一标签mhiuwergf，只包含了书籍B、书籍T，则其匹配度较低，作为次要推荐项。 The matching of the content of the history and content of the label  A5, the step of obtaining the history tab A3, and the corresponding user ID, the calculation step Al submitted, sorted by degree of match, the priority of the other higher contents of said tag search history matching user recommendations; match the same priority to other recommended contents less total content history tag, such as a user submits a search Dissatisfied B books, books F., T Books, in table I there are two labels - 1,238,989 tags and labels ikjlojdsa books are fully contained B, F. books, books T, the first priority of two other elements under the label, J such as books, books L, books Z, but 1238989 lower due to less content label, it is recommended books priority Z, J and secondly recommended books Books ー shi while a tag label mhiuwergf, contains only B books, books T, the matching degree thereof is low, as a secondary recommendation item. 本发明基于用户的输入，先搜同样爱好的人，然后再根据同样爱好的人拥有的选择或者信息来返回結果。  The present invention is based on the user input, the first search people same hobby, and then to return the results according to the selection information of the same hobby or who have. 在建立捜索数据库的时候，普通搜索引擎都是利用一些程序在互联网上收集资料，而同好捜索除了这种收集方式，更加注意以用户为单位建立数据库。 Dissatisfied with cable in the establishment of a database, use some common search engines are programmed to gather information on the Internet, in addition to cable and enthusiasts Dissatisfied with this collection method and pay more attention to the user as a unit to establish a database. 比如搜音乐，将会在用户同意和知情的情况下，将每个用户在服务器上建立ー个唯一ID (分为注册用户和非注册用户，非注册用户将会根据用户电脑自动算出唯一码，自动将用户进行分类），同时，在用户知情同意情况下，将其所拥有的音乐信息上传至服务器存储在历史搜索数据库中。 For example, search for music, will be in the user's consent and informed, each user will establish ー unique ID on the server (divided into registered users and non-registered users, non-registered users will automatically calculate a unique code based on the user's computer, users will automatically be classified), while in the user informed consent, to upload their own music to the server information stored in the database search history. 当用户使用同好捜索的时候，也会将每次使用时所建立的标签和标签涉及到的音乐信息同样上传到此用户的数据库内。 When the user uses enthusiasts Dissatisfied with cable, will also tag and label each time using the established related to the same music uploaded to this information within the user's database. 应当理解的是，对本领域普通技术人员来说，可以根据上述说明加以改进或变换，而所有这些改进和变换都应属于本发明所附权利要求的保护范围。  It should be understood that those of ordinary skill in the art, can be modified or converted according to the above description, and all such modifications and variations shall fall within the scope of the appended claims of the invention. 1. 一种搜索方法，其特征在于，包括如下步骤： Al，捜索用户在客户端提交自己感兴趣的内容，根据所述内容生成与所述内容对应的标记标签； A2，将搜索用户的ID、步骤Al所提交的内容以及所述标记标签上传至服务器，存储在历史搜索数据库中； A3，判断在所述历史捜索数据库中是否存在ー历史标签，该历史标签下的内容与步骤Al所提交的内容相同或相近似；若为否，则执行步骤A4 ;若为是，则执行步骤A5 ； A4，在所述历史捜索数据库中是否存在ー历史内容，与步骤Al所提交的内容相同或相近似，若为是，则获取该历史内容所在的用户ID及其ID下所记录的其他内容，向所述搜索用户推荐该ID下所记录的其他内容；若为否，则向所述搜索用户推荐一般捜索结果； A5，获取步骤A3所述的历史标签，及其对应的用户ID，计算步骤Al所提交的内容与所述的历史标 A search method, characterized by comprising the steps of: Al, cable Dissatisfied client user submits the content of interest, generate tag label corresponding to the content according to the content; A2, searches for the user's ID , and the content of the tag label step Al submitted uploaded to the server, is stored in the historical search database; A3, determines whether there is the history in the history tab ー Dissatisfied cable database, and the contents of the history tab in step Al submitted same content or approximated; if no, proceed to step A4; if yes, step A5; A4, ー historical content exists in the history Dissatisfied cable database, the same content as in step Al submitted or phase approximately, if YES, the user acquires other contents ID and the ID of the history of the recorded content is located, the other recommended contents recorded in the ID to the searching user; if not, then search to the user Dissatisfied generally recommended search result; historical standard A5, the step of obtaining the history tab A3, and corresponding to the user ID, the content of Al calculation step with said submitted 下的内容的匹配度，按照匹配度进行排序，优先向所述搜索用户推荐匹配度较高的历史标签下的其他内容；相同匹配度下，优先推荐内容总量少的历史标签下的其他内容。 Matching content at, sorted according to the degree of matching, the search priority to match the other contents recommended to the user a high degree of history tab; Match the same priority to other recommended contents less total content history tag . 2.根据权利要求I所述的搜索方法，其特征在于，所述步骤A2具体执行以下操作： A21，服务器的历史搜索数据库中是否有捜索用户的ID，若为是，则将步骤Al所提交的内容及其标记标签存储至历史搜索数据库中，若为否，则执行步骤A22; A22，询问搜索用户是否注册ID，若为是，则进行ID注册为搜索用户建立ID后，则将步骤Al所提交的内容连同所述建立的ID及其标记标签存储至历史搜索数据库中；若为否，系统为搜索用户提供计算ID，将步骤Al所提交的内容、所述计算ID及其标记标签存储至历史搜索数据库中。 The search method according to claim I, wherein said step A2 carries out the following operations: if there is cable Dissatisfied user ID A21, historical search database of the server, if YES, the step Al submitted the content and markup tags to store the search history database, if it is not, proceed to step A22; A22, asking whether to search user ID registration, if yes, then perform the search user ID is registered as the establishment of ID, then step Al filed together with the content ID and the tag label established history stored in the search database; if NO, the system provides a user ID is calculated for the search, step Al content submitted, and the calculated tag ID tag storage to the historical search database. 3.根据权利要求I所述搜索方法，其特征在于，所述客户端为计算机或智能手机終端或掌上电脑。 3. I claim the search method, wherein the client terminal is a computer or a smart phone or PDA.